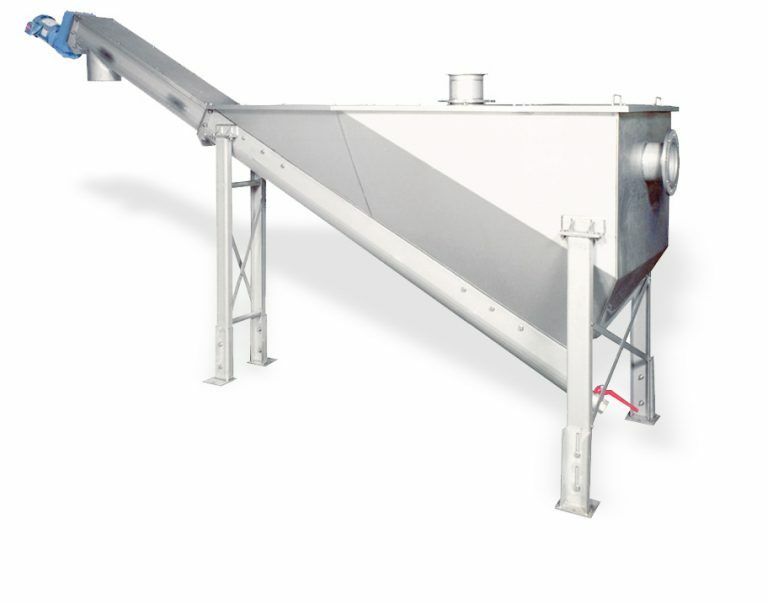 The Model ESK Grit Classifier separates organic materials from heavy inorganic sediment. Stainless steel sedimentation tank fitted with a flanged inlet, outlet connections and covers to fully enclose the process liquid and sediments. A ball valve is installed at the bottom for draining. The Model ESK Grit Classifier receives the mixed flow of process liquids and sediments, designed to minimize turbulence and maximize settling of heavy inorganic sediments so that optimum separation is achieved. The process liquid and lighter organic material exits the tank after passing over the fixed weir, while the heavy inorganic sediment is retained in the tank until the shaftless spiral transports it to the point of discharge. The spiral runs intermittently at a slow RPM to dewater the sediments.